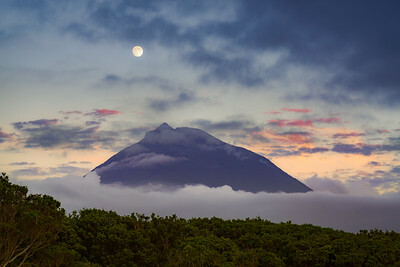 Living on Pico Island, I have the chance to shoot Mount Pico in a variety of different conditions. 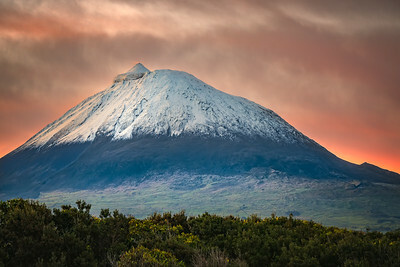 This gallery contains my best shots of the volcano. 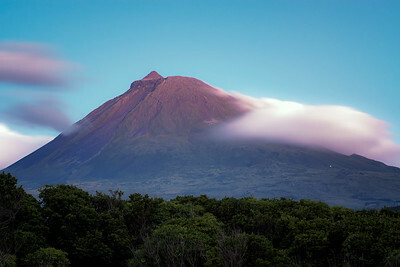 Mount Pico - the highest peak of Portugal - is a stratovolcano located on Pico Island (Azores). 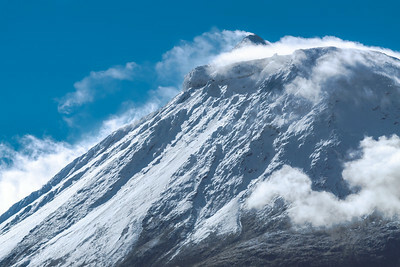 It last erupted in 1718. 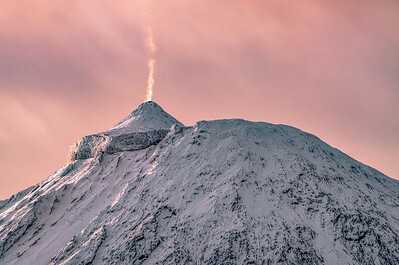 The fumarole is rarely visible on Mount Pico, with higher chances of observing it in winter and early spring, when air temperatures on the summit are below zero and the peak is snow-capped. I was lucky to capture it in this occasion just after sunrise. Well, I would not call it a huge Perseid meteor shower, but I like the pseudo-parallelism between the meteor, the Milky Way, the fence and the clouds. 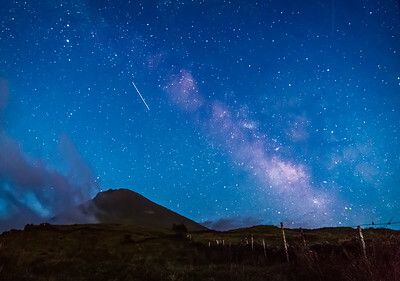 It is an unusual angle for me to shoot Mount Pico, but I am afraid there is no chance to capture the Milky Way on the volcano from my usual spot! 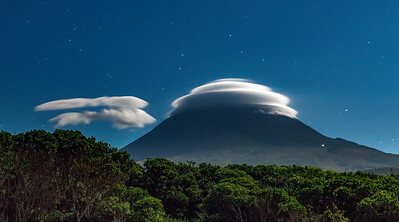 Rule number two: always keep an eye on Mount Pico while driving back home after a nice dinner with your friends. Chances are you will make it in time to capture something special. Rule number one: always have your camera with you! 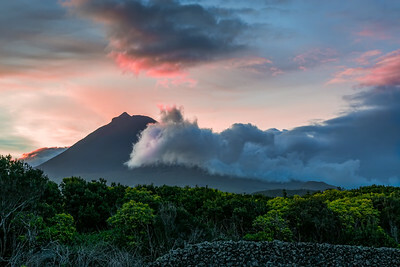 ..and for a good reason, This is Mount Pico, located in the mid-Atlantic on Pico Island. The snow is far from being very persistent and the only way to go up is by feet! 30-second exposure in the late afternoon, right before the golden hour. Clouds were moving very slowly, but they still show a lovely silky effect. 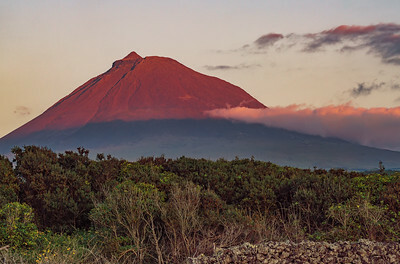 Mount Pico is located on Pico Island and it is the highest peak of Portugal (2351 metres). Full moon on Pico summit, a shot I captured on 19 June 2016. The cloud ring was a real bonus, as it formed very quickly and just as quickly it became much more diffuse and less interesting. 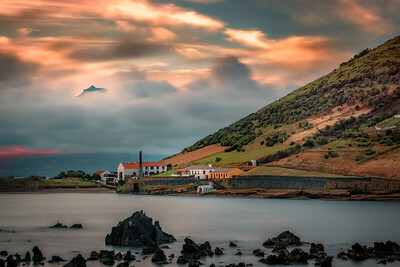 This is a HDR (High Dynamic Range) picture, as a single shot would not have been enough to capture the entire dynamic range of the scene. In other words, I would have either ended up with a very dark mountain or an overexposed moon. The technique I used to post-process the image is called exposure blending and rendered the scene as I observed it that night. 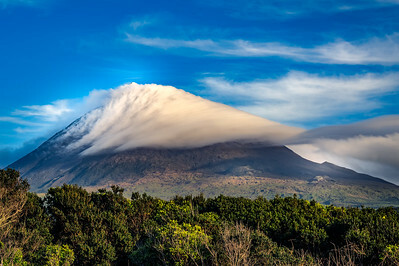 The summit of Mount Pico was wrapped in clouds in such a way that it looked stormy to me. On the other hand, the warm light on the rest of the mountain produced a feeling of peace. It was because of this unusual contrast that I quickly got my camera and captured the shot. 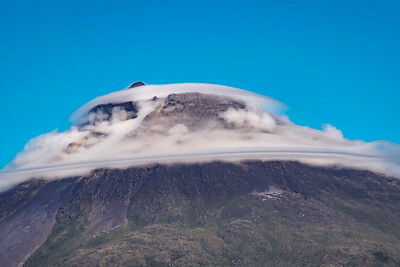 A very unusual cloud formed on Mount Pico, which will later completely covered it. While that was happening, it felt to me like I had caught Pico in the act of wearing an invisibility cloak! 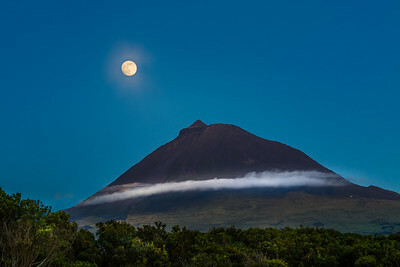 When the full moon rises early and the sky starts to darken, Mount Pico gets as crisp as it can be observed. 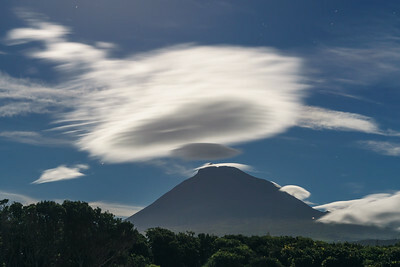 The most amazing cloud funneling on Mount Pico (2351 metres) I have captured so far. Another shot I took because I loved the natural colour gradient in the sky. I find some scenes so peaceful that it does not matter to me if there are no dramatic clouds or super intense colours. This is one of those scenes. 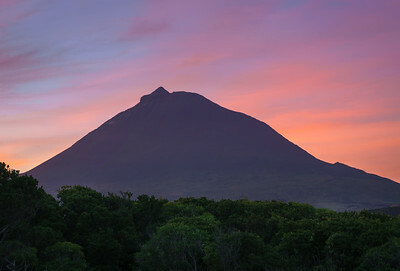 Sometimes Mount Pico (2351 meters) shows shades of red and this is the my best shot of such redness. 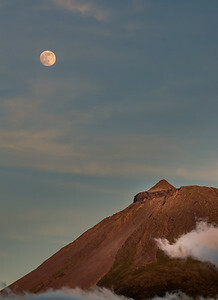 The photograph was taken before sunset, so that the sky was still rather bright, providing good contrast between the background and the volcano. 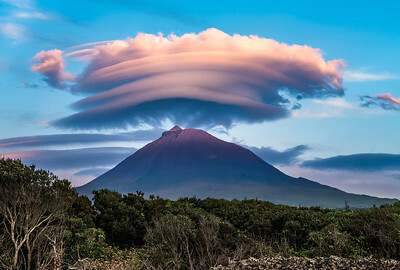 Clouds on the volcano, clouds above the blue sky. The result? The sky was sandwiched between two layers of clouds! Despite the panorama format, this is a single shot that I cropped to get what I thought was the best aspect ratio for this image. 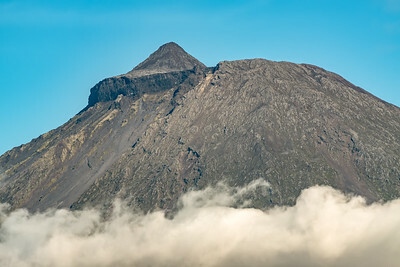 I always wanted to capture the details of the summit of Mount Pico with a telephoto lens (300mm), but that requires a day of outstanding visibility and low humidity. I finally had such chance on 18 June 2016 and this is the result. 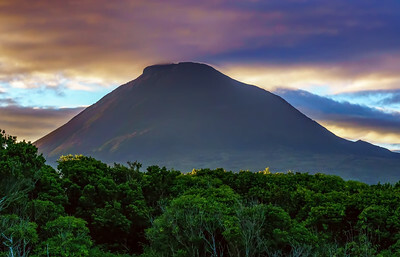 Mount Pico - the highest peak of Portugal (2351 metres) - is a stratovolcano located on Pico Island, Azores, which last erupted in 1718. 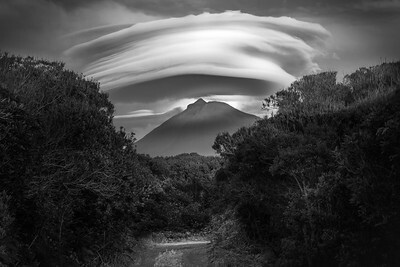 I have only seen such a massive, turban-shaped cloud once in my life. A colour version of the Pico Turban is accessible here. 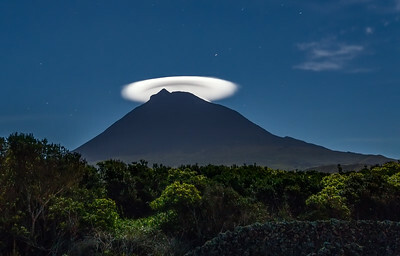 Night shot of Mount Pico with a lenticular cloud obscuring its summit. This is 30 second exposure and star trails are evident. I very much love the cloud formation on the left-hand side of the image. 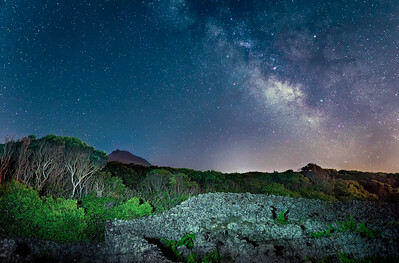 Mount Pico watching a fight between the Milky Way and light pollution, while a sleepless photographer is light painting lava rock walls and vineyards.